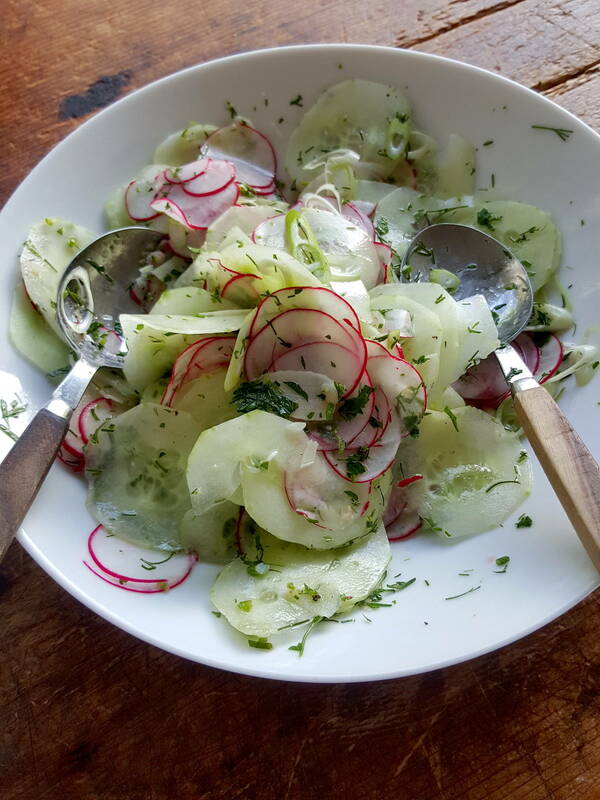 Radish & cucumber salad has a nice hot kick. Perfect with fish. Make the most of fresh produce while in season. And, yes, I know, there is a touch of sugar in this recipe, but it is necessary (I’ve cut it back as much as I dare). 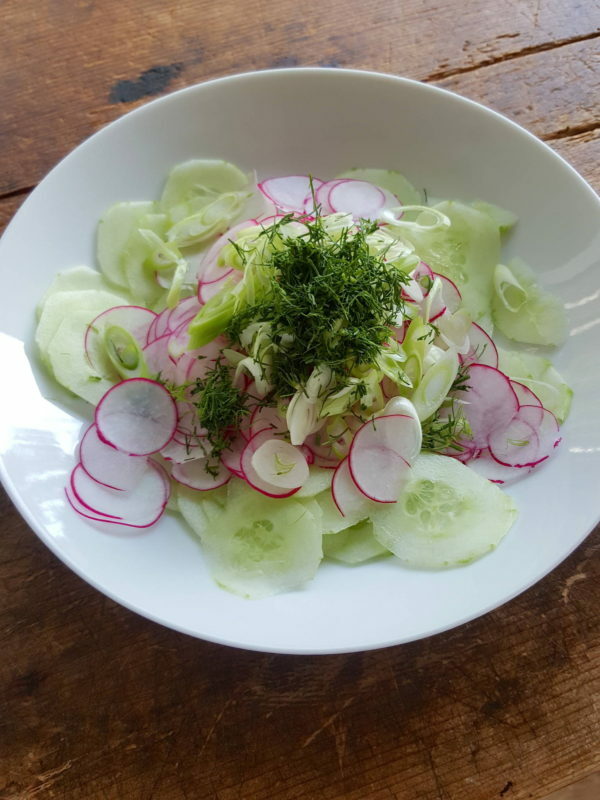 1 Prepare the radish, cucumber and spring onion and chop the herbs. 2 Prepare the ginger, garlic and chilli. Whisk the vinegar and sugar together in a bowl and add the sesame oil, garlic, ginger, chilli, salt and black pepper. 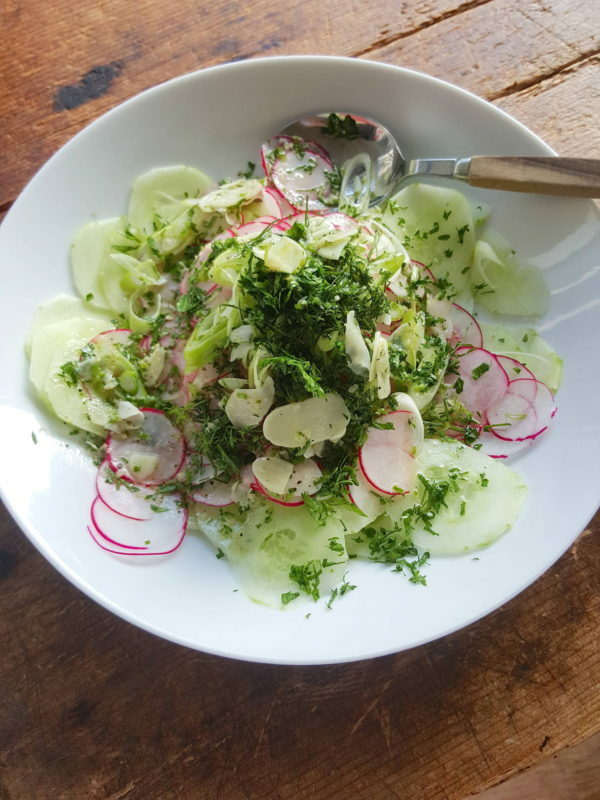 3 Stack ingredients in a shallow bowl in this order: cucumber, radish, spring onions and herbs. Pour the dressing over and toss. Serve immediately. If slicing radish on a mandolin, leave the greenery on to give you something to hold on to while doing it. The cucumber can also be sliced on a mandolin (watch those fingers!). And, watch the chilli! First time I made this I nearly blew my head off with a really hot green chilli. I rescued my tongue with a big bowl of strawberry ice cream. As you do. Rich, yes. Gorgeous, YES! Sweet corn caramelised on a barbecue then slathered with tarragon butter & mayo, and dusted with parmesan, cumin & smoked paprika, served with lime wedges, is a winner!